Freedom House released on May 1, 2009 in advance of World Press Freedom Day May 3 Freedom of the Press 2009 report which identifies the greatest threats to independent media in 195 countries and territories. The report shows a seventh straight year of decline in global media freedom, with twice as many losses than gains. There are particularly worrisome trends in East Asia, the former Soviet Union and the Middle East and North Africa. Examination of the level of press freedom in each country currently comprises 23 methodology questions and 109 indicators divided into three broad categories: the legal environment, the political environment, and the economic environment. For each methodology question, a lower number of points is allotted for a more free situation, while a higher number of points is allotted for a less free environment. Each country is rated in these three categories, with the higher numbers indicating less freedom. A country’s final score is based on the total of the three categories: A score of 0 to 30 places the country in the Free press group; 31 to 60 in the Partly Free press group; and 61 to 100 in the Not Free press group. The legal environment category encompasses an examination of both the laws and regulations that could influence media content and the government’s inclination to use these laws and legal institutions to restrict the media’s ability to operate. Freedom House assesses the positive impact of legal and constitutional guarantees for freedom of expression; the potentially negative aspects of security legislation, the penal code, and other criminal statutes; penalties for libel and defamation; the existence of and ability to use freedom of information legislation; the independence of the judiciary and of official media regulatory bodies; registration requirements for both media outlets and journalists; and the ability of journalists’ groups to operate freely. Under the political environment category, Freedom House evaluates the degree of political control over the content of news media. Issues examined include the editorial independence of both state-owned and privately owned media; access to information and sources; official censorship and self-censorship; the vibrancy of the media and the diversity of news available within each country; the ability of both foreign and local reporters to cover the news freely and without harassment; and the intimidation of journalists by the state or other actors, including arbitrary detention and imprisonment, violent assaults, and other threats. The third category examines the economic environment for the media. This includes the structure of media ownership; transparency and concentration of ownership; the costs of establishing media as well as of production and distribution; the selective withholding of advertising or subsidies by the state or other actors; the impact of corruption and bribery on content; and the extent to which the economic situation in a country impacts the development and sustainability of the media. Central Asian and Middle Eastern states in the report showed no improvements and remained the same status in a row of Not free states. Kyrgyzstan showed the best result among other Central Asian former Soviet republics by 72 points and 158th place but compared to 2008 lost 2 lines. Kazakhstan and Tajikistan showed the same result – 168th place with 78 points each. At the same time Kazakhstan improved its rank from 170 in 2008, but Tajikistan remained the same. Uzbekistan, which stands accurate one line before Cuba, Eritrea and Libya, is on line 189 with 93 points. Turkmenistan shares its 193 position with Burma having 93 points. The last one in the list is North Korea with 98 points, 195 line. The most favorable states for press are Iceland, Finland and Norway with 9, 10 and 10 points on 1 and second places accordingly. The 2009 survey continues a process conducted since 1980 by Freedom House. The findings are widely used by governments, international organizations, academics, and the news media in many countries. Countries are given a total score from 0 (best) to 100 (worst) on the basis of a set of 23 methodology questions divided into three subcategories. Assigning numerical points allows for comparative analysis among the countries surveyed and facilitates an examination of trends over time. 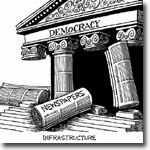 The degree to which each country permits the free flow of news and information determines the classification of its media as “Free,” “Partly Free,” or “Not Free.” Countries scoring 0 to 30 are regarded as having “Free” media; 31 to 60, “Partly Free” media; and 61 to 100, “Not Free” media. The ratings and reports included in Freedom of the Press 2009 cover events that took place between January 1, 2008, and December 31, 2008. It is usual that totalitarian regimes evaluate Freedom House’s reports as biased and without any real ground. But reports of the organization are approved as fair ones by democratic states. Thus, report can’t be blamed for prejudicing.